1. They were the evening star and the morning star. 2. They were the dusk and the dawn. 3. They were day and night, or the sun and the moon, A study of the references to these fine conceptions will prove that as persons they were soon endowed with noblest qualities of soul, and were considered brave, heroic, magnanimous, and helpful to man, and their fraternal affection is almost without parallel. Their offices were therefore helpful and inspiring. They were supposed to preside over manly sports, and to have special interest in martial music and the war-dance. 1. Homer calls them sons of Tyndareus and Leda, and brothers of Helen, so noted in the Trojan War. He said of them that they were buried, and then they rose again on alternate days. 2. Another tradition says that both brothers, and also Helen, were the children of Zeus and Leda, and that they were produced from an egg. 3. The tradition most generally accepted is, that Pollux and Helen were the children of Zeus and Leda, while Castor and Clytemnestra were the children of Leda and Tyndareus. 1. Helen, the sister of the Dioscuri, lived with King Tyndareus at Sparta. Theseus carried her to Aphidna, and placed her under the strict supervision of Aethra, his mother. In the absence of Theseus from Attica, the Dioscuri entered and ravaged the country, rescued their sister Helen, and brought away Aethra as a prisoner. 2. In the country of the Bebryces, Pollux met in single contest and conquered Amycus, the giant son of Poseidon. 3. The Dioscuri took part in the Calydonian Hunt, also in the Argonautic Expedition. A pretty story is told of the brothers while they were with the latter. During a violent storm the Samothracian deities were invoked, the storm subsided, and stars appeared on the head of the Dioscuri. During this expedition they founded the city Dioscurias. 4. 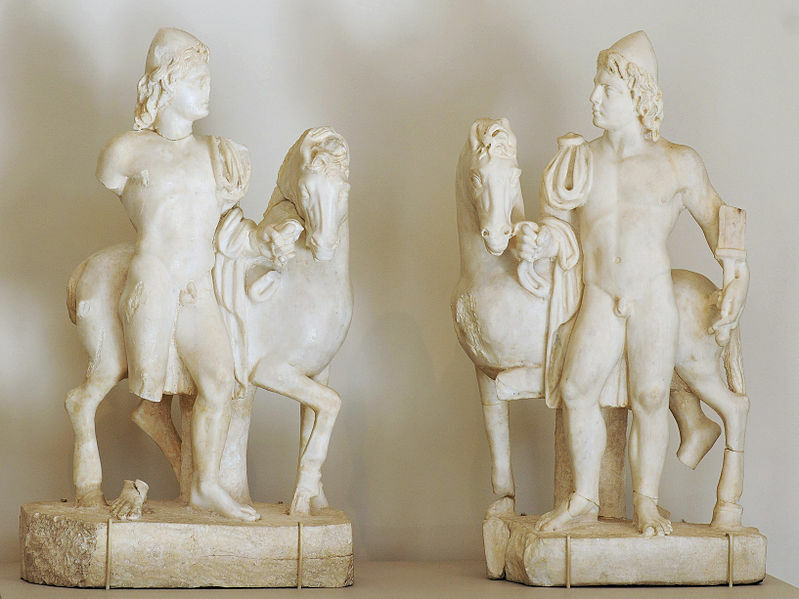 These brothers joined Idas and Lynceus (sons of Aphareus) in carrying away a herd from Arcadia. Idas took possession of the herd; a war between the two parties followed, and was conducted in Laconia. Castor, being mortal, was slain by Idas, who was himself destroyed by a flash of lightning sent by Zeus. Pollux killed Lynceus. Out of this story grows one of the finest illustrations of fraternal love that the mind has conceived. Pollux prayed that Zeus would permit him to die, that he might be with his brother, who, being mortal, must needs descend to the land of shades. 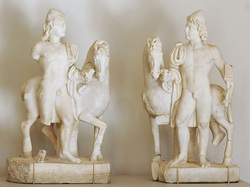 As Pollux was immortal (by reason of his divine descent), Zeus would not grant his request, but permitted him to relinquish the celestial joys of Olympus on alternate days, that he might spend them with his brother in Hades. It is believed by some that as a reward for this superhuman love the Dioscuri were placed among the stars as Gemini, while others said that Poseidon did reverence to their devotion by giving them control of the winds and waves, and that ever after, when shipwrecked mariners addressed their prayers to the Dioscuri, they came on golden wings to quiet the storm and to lend all needed aid. It was believed that "St. Elmo's Fire" was a bright signal of the presence of Castor and Pollux. Two parallel bars, joined by cross-pieces (each bar representing a plank of wood as a symbol of deity). Long lances. 1. Two noble youths riding on splendid white horses,each bearing a spear and wearing a conical helmet surmounted by a star. 2. In th e palaestra (places for wrestling), as patrons of athletic games. 3. The colossal statues called the " Colossi of Monte Cavallo" represent the Dioscuri (Quirinal in Rome). Location.—Sparta was the centre of this worship, but it spread over Greece, Italy, and Sicily, and even the Olympic Games were under their special protection. Photo credit: © Marie-Lan Nguyen / Wikimedia Commons.